We carry a full line of GE LED bulbs, that offer bright light and instant on illumination, while saving up to 90% in energy consumption, compared to their incandescent brethren. 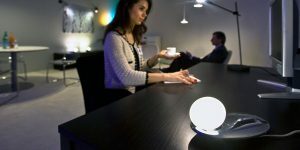 By installing a home automation system, we can control when the lights are on, and dim them. We will program a green mode, which you can turn on or off when you like, or have set to be on at certain times of the day (you probably do not need those lights on full power when the sun is shining, for instance). You can also turn them all off at night, or from your phone or work computer. We can also install motion sensors, connected to your home automation system, and have lights only come on when people are present (great for pantries and closets). Also – how about the blinds? Let us install motorised and automated blinds, to open when the sun is shining in the winter, letting in needed light, as well as heating the room. And when no one is home, have them automatically close in the summer – this increases your homes security as well as reduces the HVAC requirements. And we can synchronise them with your TV or Media needs, creating pre-programmed ‘scenes’, such as Movie Scenes or Party Time. Contact us to show you your options. Let’s face it, the power bill soars in the summer. 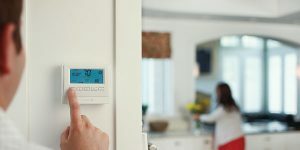 While installing an energy efficient HVAC is likely the best first step, letting us automate the room controls and sensors is a great next step. Program a green mode, that dims the lights, turns the AC up a few notches, and closes the blinds – and when you leave the house, hit a button on the way out to activate the mode. We can also install room temperature monitors and software to allow you to see what is using electricity, and when and where. Contact us to show you your options.